Girl Talk makes mash-ups, but that doesn’t make him a DJ. Gillis’s last record, 2010’s All Day, contains 373 snippets of other artists’ songs. Herbie Hancock, Bananarama, Justin Timberlake and Phil Collins share air time on the song “This Is the Remix,” and that’s in the first minute alone. 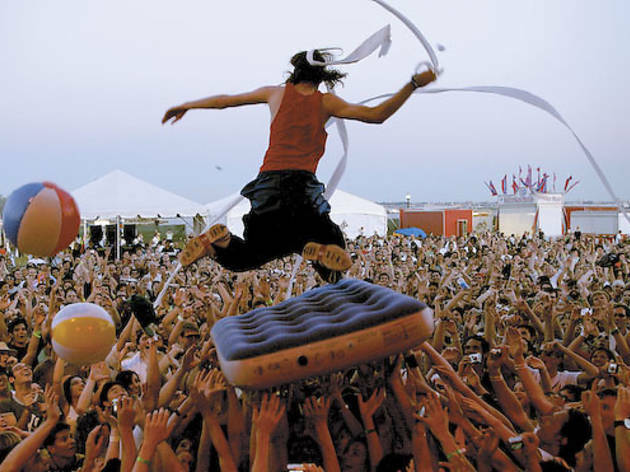 This musical short-attention-span theater is no different in Girl Talk’s live shows. In fact, it’s the main draw for non-Coldplay and Muse fans at Lollapalooza on Friday 5, where Gillis headlines Perry’s stage. With that many components triggered by hand, he’s certainly taken the mash-up beyond the DJ realm where at most three or four songs can be manipulated. “Mash-up isn’t, like, a dirty word to me. Obviously my stuff is indebted to it, but from the get-go I was trying to take the idea and do a weird, perverted take on it,” Gillis says. Girl Talk works his mash-up magic on Perry’s Stage at Lollapalooza at 8:45pm on Friday 5.